Thailand, a wonderful country, some of the most welcoming people I have met in my travels. Phuket should just be a start as exploring inland to the mountains and other locations is astounding. This country does not disappoint in any way. The food is outstanding, if you have had the best Thai food outside Thailand, it will be a shadow of what you experience at a road side stand or a family run restaurant. I did not have the pleasure of exploring Thailand by water but I did stay both in Phuket and another wonderful island named Koh Samui. 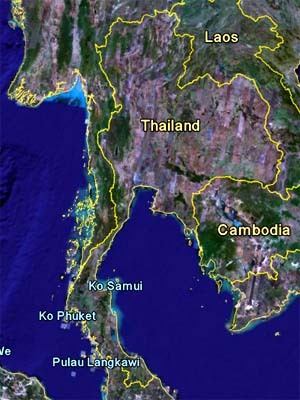 It is much quieter then Phuket and is located Gulf side near a national marine park. You can drive around it in less then a day. There are waterfalls to hike to and elephants to play with. The beaches are uncrowded and relatively simple to find. If you have been to Thailand and can add information regarding great places to visit by boat, please Email me your comments and I will post them.